10 minute walk from Ishizugawa Train Station, Hotel Fine Sakai offers rooms with a flat-screen TV and karaoke facilities. This property features free parking and a 24-hour front desk. Free Wi-Fi is available at the entire hotel. 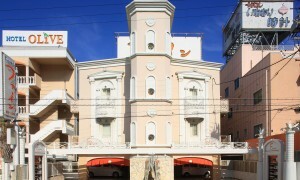 Sakai Fine Hotel is a 15-minute drive from Aguchi Shrine and a 20-minute drive from the Emperor Nintoku Tomb. It is 21 km from Osaka Castle and 30 km from Kansai Airport. 25-minute drive from the Kaiyukan aquarium. Kansai Airport is a 30-minute drive, and Namba Station is a 35-minute train ride. Cosy rooms come with modern décor and warm lighting. Included in all units are a fridge and electric kettle. A bathtub, bathrobes and slippers are in the en suite bathroom. Rooms have TV channels, and all rooms allow to smoking. The hotel has a vending machine and provides luggage storage facilities at the front desk. Ironing and suit pressing services are available upon request. The tomb mounds, scattered in the city, reminds us of ancient times. From the observatory hall of the city hall of Sakai you can command the entire view of the huge Daisenryo Kofun tomb. At the tearoom in the Japanese garden in the Daisen Park, you might sense the spirit of Sen-no Rikyu, famous Sakai born historical figure who established the tea ceremony. You can see and experience the technology of knife production, Sakai’s traditional industry, at Sakai Hamono Museum. 2. get off at Namba. 4. 10 minutes walk from Ishizugawa station. 1.Take Nankai Electric Railway Nankai Honsen line from Kansai Airport to Ishizugawa. It takes approx 45 minutes and fare is 780JPY. 2.10minuites walk from Ishizugawa station. Smoke-free Policy All rooms allow smoking. We will try to remove smoking smell, if you would like to stay in non-smoking room.